Hi folks, and welcome to July already! Seems like the summer is just flying by. 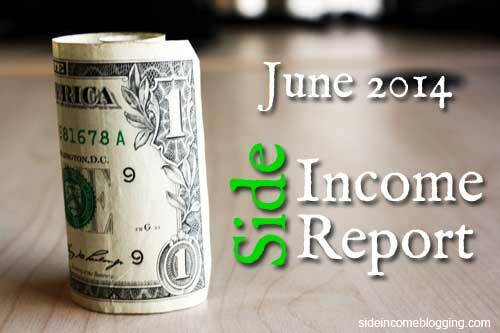 June was interesting month for me income wise. Overall, my earnings were down from May by a good amount. But with that said, May was an exceptional month too, so hard to compete with. My Adsense and Amazon Affiliate revenue were both down from May. My Adsense was down due to having to be out of town for almost a week due to a death in the family. Most of my adsense income comes from my Blue Ridge Mountain Life Facebook page and the traffic the Facebook sends to the website. Google’s Panda update did cause a few of my rankings to shuffle around a bit, but they all returned to normal for the most part, and I even saw increases during July for many keywords across my sites. For example, one of my primary niche sites now ranks in the top 5 for two of my primary target keywords. Side Income Blogging was impacted the most by the Panda updates. After analyzing things for a few weeks, the big hit I took on rankings was ranking for multiple keywords on the same article. For example, I was ranking for “blog names” and “good blog names” for the same article. “Blog names” had a high bounce rate. I was ranking in the top 10 for that keyword, and now not ranking at all. Overall though, not the month I had hoped for, but my Adsense income is returning to normal, and my Amazon affiliate income is growing like crazy, and June was a record month for Adsense income. Remember, I report money I actually receive in my accounts on my income reports, so June Amazon income won’t be reported until August, since Amazon pays 2 months “in the rears”. I spent time in June doing a number of activities, including writing content, working on my new niche site duel site, and building out a Private Blogging Network (PBN). I’m hoping to share my PBN building process with you soon. I’ve also been researching niches, as I would like to start another niche site. I would love to have 4 or 5 niche sites, earning $500 – $1000.00 each. I’ve also been doing a great deal of reading and research on Teespring campaigns, and plan to run a few in July. I’ll keep you posted on how those go. Now for the June numbers…. Hosting: $112.28 – This is up due to my PBN sites. EasyBayPro: $21.00 – The makers of EasyAzon released a new plugin for eBay, so I bought it. Planning to try out some eBay based niche sites. I’ll be very interested to see how an Ebay niche site would do for you. I assume you are already in the eBay Partner Network? Getting accepted seems to be far more difficult than other affiliate programs. Thanks Tom and definitely a good month for you. Congratulations. Yes, I already have an active EPN Account. I’ll keep everyone posted on how it goes. Still searching for a good niche right now. Great report. your still doing very well and I think you will get some good results next month. really enjoy your blog and loved your blogging report, made me get back on track with my blog. This is a good progress. You’re doing great with your nich sites. I have plan to build more niche site and PBN too. Hope to read your progress on all of projects. Good job man, Keep it up! I always love reading your updates. I took a rather large hit on my income in may myself, but it’s alright because I know exactly why and I know I can get it back up. Hey, we’re making a few hundred dollars every month to now, we’ve cracked the code, now we just gotta keep cranking it out!